If you want to have a garden where you don’t have to bend over to the ground, do not have to weed and can have the worse soil around, then straw bale gardening might be for you. There has been a resurgence in straw bale gardening due to its simplicity and ease of use. The straw bale is used as the container for the plant. The first thing to do is position the bale or bales. Be sure the strings are on the side. If they are on top the bale can come apart if they are cut will planting. The bale should be on the narrow side with the cut side facing up and the folded straw side facing down. The straw bale or bales have to be conditioned before they are used. This is done by wetting the bale daily so the microbes inside the bale will start to compost. Sometimes some nitrogen is added to help get the process going. The bales will start to heat up internally and the temperature can rise to 120F to 140F. This is why you want to condition the bale so it doesn’t cook your seeds or plants. This process will take a couple of weeks to complete. You will know when it’s done by the temperature becoming close to ambient. This can be determined by a thermometer or sticking your finger into the bale to judge the temperature. Once the process of conditioning is done, it is time to plant. If the bales are arranged end to end a metal fence post can be driven at the end of each row then wire strung from post to post. A header board is put at top to keep the post from drawing into each other. 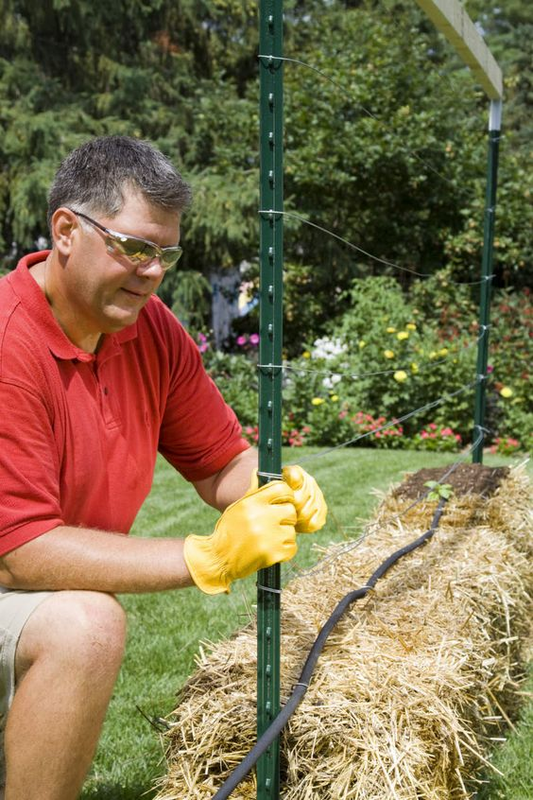 With multiple wires, this will work as a trellis for your plants as they grow vertical. If it is still cool weather, a piece of plastic can be hung over the trellis to have a greenhouse effect. Two methods are used for planting. The first method is to place a thin layer of potting soil on top of the bale and then place seeds in the soil and cover with another thin layer. This will help to keep the seeds moist and protected. The warmth of the straw bale will help in germination. The second method is to dig out a plug of straw about the size of the root ball of the plant, then place you plant in the now vacant hole. You can place the straw back around the plant. The bale and plants will need to be watered daily. The best way to accomplish this is with a drip irrigation method. The water will run through the bale so be sure to keep it moist, but not waste water. Since a straw bale has little to no nutrition, it is a good idea to feed your plants. Compost placed around the roots of the plants will also help in the feeding. Just to make the most use of the bale, other plants can be planted on the sides of the bale. Flowers can be planted to make for an appealing garden for the eye and for pollinators. When fall comes around the plants can be harvested and the remains of the straw bale used for compost. Straw bale gardening encompasses container gardening, raised bed gardening all in one. It is a way for those in urban areas to be able to have a garden, even if one bale and on the back deck. It is economical and an easy way to have a garden without all the normal digging and weed pulling that accompanies in ground gardens. “Beginner’s Guide to Straw Bale Gardening.” Safer® Brand. N.p., n.d. Web. 03 May 2017. “How to Condition and Plant a Bale of Straw for Gardening.” Bonnie Plants. N.p., n.d. Web. 03 May 2017.